The Pyzique Round Firepit Kits come complete with 60 pieces (4 extra) of Cambridge Pyzique Wallstone. This pit is designed to be finished with a 50″ outside diameter and 32″ inside diameter. 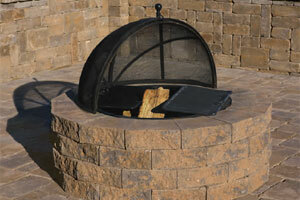 Also included in the Firepit kit is a heavy-duty metal insert with double cooking grates. The metal ring insert has dual opposing cooking grates. Designed to cantilever over the fire for cooking, they can be easily tipped back for fire building or slid back for an unobstructed view and use of the fire. Pyzique Wallstones are available in Split Face and Renaissance styles. Optional blocks available to build pit higher.